Functions map inputs with outputs as expected from a performing agent whatever its nature (concrete or abstract) or means (physical, logical, or magical). They are not to be confused with objectives (which don’t necessarily specify performing agents or detail inputs) nor with activities (which purport to describe concrete execution paths). Those distinctions are critical when the aim is to align business processes requirements with systems architecture capabilities. 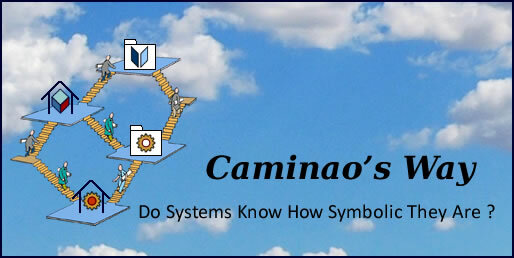 Functions are complete (contrary to objectives) and abstract (contrary to activities) descriptions of what organizations (represented by actors), system architectures (represented by services), or objects (through operations) can do. As such they are akin to interfaces or types, and cannot be instanciated on their own. Processes on the contrary describe how activities are executed, i.e instanciated (#). Business processes describe sets of execution instances (#). Functions describe what can be expected from enterprise or functional architectures. Business logic describe how the flows are to be processed. Business processes can be defined with regard to business functions independently of the way they are supported. Business rules can be managed independently of the way they are applied, by people or systems. Business logic can be factored out in functions (business or systems) or set within specific processes. Yet that would not be possible without some modeling across enterprise architecture layers. Functional flows are used between processes and functions (a) or actors (d), or between actors and functions (e). Composition or aggregates are used to specify where the business logic is to be employed, by functions (b) or by processes (c). Documentation references (f) are used between unspecified actors and business logic, in case it would performed by people. Semantics of connectors: functional flows (a,d,e), aggregates (b) and composition (c), and documentation (f). Finally, the semantics of connectors used between functions will have to be consistent with the one used to connect them to processes and activities. 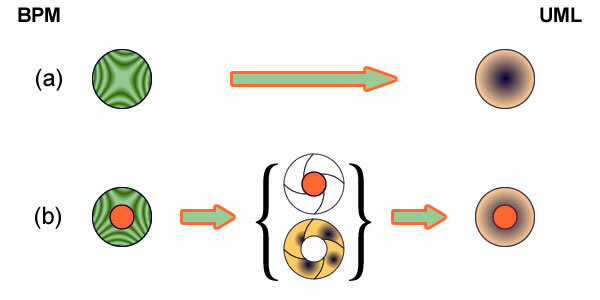 Traditional structure connectors are set with regard to identification: bound to structure for composition, set independently otherwise. Since functions have no instances that criterion is irrelevant and the same reasoning goes for composition. Likewise, since functions have no states to be considered, inheritance of functions can be represented by aggregates. As far as functions are concerned, structures as well as inheritance connectors can be fully and soundly replaced by aggregate ones, which could significantly improve the mapping of business processes, activities, and supporting functions. As can be understood from their theoretical basis (Pi-Calculus, Petri Nets, or State Machines), processes are meant to describe the concurrent execution of activities. Assuming that large enterprises have to keep a level of indirection between operations and business logic, it ensues that activities and business logic should be defined independently of the way they are executed by business processes. For that purpose two basic modeling approaches are available: BPM (Business Process Modeling) takes the business perspective, UML (Unified Modeling Language) takes the engineering one. Yet, each falls short with regard to a pivotal conceptual distinctions: BPM lumps together process execution and business logic, and UML makes no difference between business and software process execution. One way out of the difficulty would be to single out communications between agents (humans or systems), and specify interactions independently of their contents and channels. That could be achieved if communication semantics were defined independently of domain-specific languages (for information contents) and technical architecture (for communication channels). As it happens, and not by chance, the outcome would neatly coincide with use cases. Business and functional requirements (see Requirements taxonomy) can be expressed with formal or natural languages. Requirements expressed with formal languages, domain-specific or generic, can be directly translated into some executable specifications. But when natural languages are used to describe what business expects from systems, requirements often require some elicitation. When that challenge is put into a linguistic perspective, two school of thought can be considered, computational or functional. The former approach is epitomized by Chomsky’s Generative Grammar and its claim that all languages, natural or otherwise, share an innate universal grammar (UG) supporting syntactic processing independently of their meanings. Nowadays, and notwithstanding its initial favor, that “computer friendly” paradigm hasn’t kept much track in general linguistics. Alternatively, the functionalist school of thought considers linguistics as a general cognitive capability deprived of any autonomy. Along that reasoning there is no way to separate domain-specific semantics from linguistic constructs, which means that requirements complexities, linguistic or business specific, have to be dealt with as a lump, with or without the help of knowledgeable machines. In between, a third approach has emerged that considers language as a functional system uniquely dedicated to communication and the mapping of meanings to symbolic representations. On that basis it should be possible to separate the communication apparatus (functional semantics) from the complexities of business (knowledge representation). Assuming the primary objective of business processes is to manage the concurrent execution of activities, their modeling should be driven by events and their consequences for interactions between business and systems. Unfortunately, that approach is not explicitly supported by BPM or UML. The BPM perspective is governed by business logic independently of interactions with systems. Executable UML approaches are centered on software processes execution, and their extensions to action semantics deal essentially on class instances, features value, and objects states. 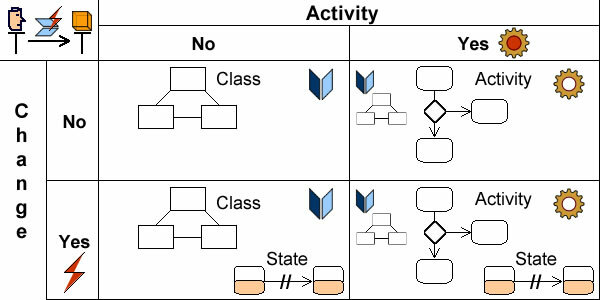 Such shortcomings are of no serious consequences for stand-alone applications, i.e when what happens at architecture level can be ignored; but overlooking the distinction between the respective semantics of business and software processes execution may critically hamper the usefulness, and even the validity, of models pertaining to represent distributed interactions between users and systems. Communication semantics may help to deal with the difficulty by providing relevant stereotypes and patterns. Dock process interactions (aka sessions) to their business context: references to agents, business objects and time-frames. Specify interactions: references to context, roles, events, messages, and time related constraints. Specify information: structures, features, and rules. Communication with systems: dock to context (1), interactions (2), information (3). Although modeling languages and tools usually support those tasks, the distinctions remain implicit, leaving users with the choice of semantics. In the absence of explicit guidelines confusion may ensue, e.g between business rules and their use by applications (BPM), or between business and system events (UML). Hence the benefits of introducing functional primitives dedicated to the description of interactions. Such functional semantics can be illustrated by the well known CRUD primitives for the creation, reading, updating and deletion of objects, a similar approach being also applied to the design of domain specific patterns or primitives supported by functional frameworks. While thick on the ground, most of the corresponding communication frameworks deal with specific domains or technical protocols without factoring out what pertains to communication semantics independently of information contents or technical channels. Communication semantics should be independent of business specific contents and systems architectures. But that distinction could be especially productive when applied to business processes as it would be possible to fully separate the semantics of communications between agents and supporting systems on one hand, and the business logic used to process business flows on the other hand. No change: messages relating to passive (objects) or active (performed activity) states. 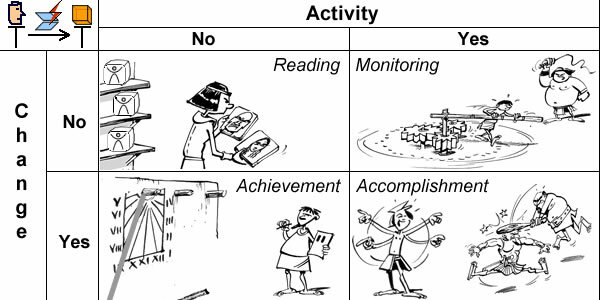 Change: messages relating to achievement (no activity) or accomplishment (attendant on performed activity). Communication semantics can then be fully rounded off by adding changes in agents’ expectations to the ones in the states of objects and activities, all neatly modeled with state machines. Communication semantics: changes in expectations, objects, and activities. It must also be noted that factoring out the modeling of agents’ expectations with regard to communications is in line with the principles of service oriented architectures (SOA). Address space : single or different. Mode: information, request for information, or request for action. Organizing business processes along those principles, would enable the alignment of BPMs with their UML counterpart. Use cases can be seen as the default entry point for UML modeling, and as such they should provide a bridge from business process models. 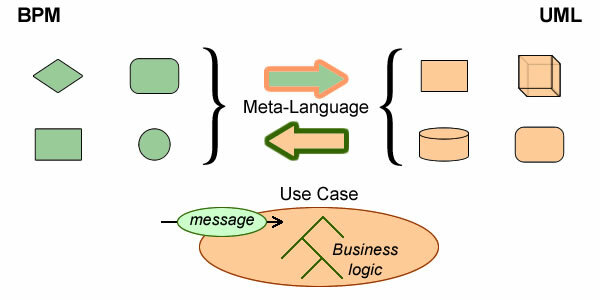 That can be achieved by if use cases are understood as a combination of interactions and activities, the former obtained from communications as defined above, the latter from business logic. Communication semantic constructs could be mapped to systems architectures, ideally to services oriented ones. 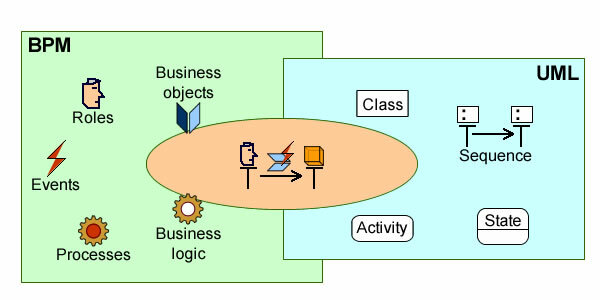 Business objects and logic could be mapped to software applications, e.g through domains, objects, and aspects. Last but not least, the consolidation of models contents at architecture level would be congruent with modeling languages, BPM and UML. Havey Michael. “Essential Business process Modeling”, O’Reilly (2005).